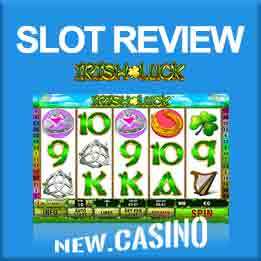 Gaelic Luck Slot Review by New Casino - Are you feeling lucky??? Playtech started 2018 out right by releasing the new Irish themed online slot machine game, Gaelic Luck. Though many other software companies have already done this, Playtech does it better than most. The game jumps off the screen at players and somehow remains simple and exciting at the same time. Set against a bright green background containing four-leaf clovers, the reels include the standard slot machine symbols as well as three beautiful women, each wearing pink, green or blue. The game’s wild and scatter symbols are, respectively, a pot of gold and a rainbow located behind the Gaelic Luck logo. In addition, there is a bonus symbol that is represented by a horseshoe with a four leaf clover emblazoned on it. To trigger the game’s Lucky Lasses Bonus, players must get the horseshoe symbol on the first and last reels on the game screen within one spin. When this happens, players are tasked with choosing from the three beautiful women on the screen. The woman they choose dictates how many free spins they get. They are then taken to a screen in which they see six clovers. Choosing one of those six determines how much of a multiplier players get on their free spins. The top prize of the bonus game is 20 free spins and the amount of money a player wins from those spins is then multiplied by 10. It is important for players to realize that they may be able to retrigger free spins at any time during this bonus game. Two features make Gaelic Luck a game that is just as fun to watch as it is to play. The standard auto spin feature is offered in this game, meaning players can set the reels to automatically spin 10, 25, 50 or 99 times. For players that really want to speed up their game play, the turbo mode setting (which can be turned on and off at will) essentially shortens the time it takes to complete a spin of the reels into half of what it normally is. Those who like to anticipate what will land on the reels may want to avoid this feature, while other players may embrace it. Not overly packed with bonuses, Gaelic Luck is still a game that can keep players entertained for extended periods of time. Its visual appeal alone is enough to get many players excited about it. The lure of a possible 10 times multiplier is also a reason why players keep returning to this game.